With great power comes great responsibility. 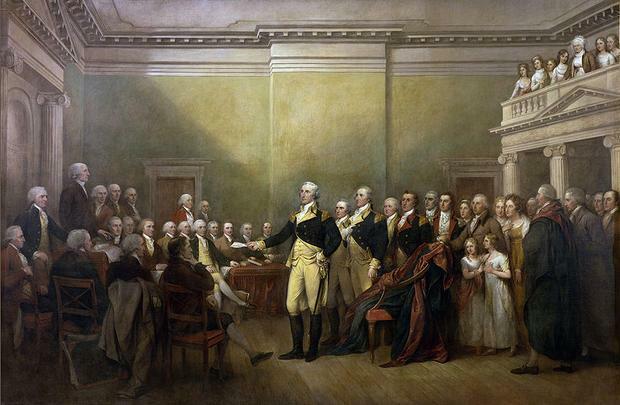 In the unsettled atmosphere of the American Revolution between the victory at Yorktown in 1781 and the signing of the Treaty of Paris in 1783, a movement arose from officers in the Continental Army to proclaim George Washington as King George I of America. As incredible as it might sound today after 200 years of U.S. democracy, it was a very real possibility and opportunity for Washington. As the military leader of the fledgling republic, he had the ability and the backing of the colonists who had put their faith and future in his hands. For Washington, leadership was not about personal gain or ambition, but instead, service to a higher purpose and a greater good. And to confirm his intentions eight years later, when the people wanted him to run for a third term—Washington again voluntarily gave up his power when he refused to be nominated. Why did George Washington do what he did? What was in the man’s mind? What can we learn from it during a time when egotistical self-serving leadership seems all to common? Those are the questions that Richard Archer explores in his post, The Spirit of Cincinnatus: George Washington and the Triumph of the Self. In His Excellency, his heralded biography of Washington, Joseph J. Ellis underscores “the truly exceptional character” of Washington’s act. “Oliver Cromwell had not surrendered power after the English Revolution. Napoleon, Lenin, Mao, and Castro did not step aside to leave their respective revolutionary settlements to others in subsequent centuries. … Whereas Cromwell and later Napoleon made themselves synonymous with the revolution in order to justify the assumption of dictatorial power, Washington made himself synonymous with the American Revolution in order to declare that it was incompatible with dictatorial power.” Ellis thus reminds us that Washington, in relinquishing power — not just once, but twice — was bucking an imperialist pattern that stretched back to the days of the Roman and English republics, and which, sadly, continues to this day. February 20, 2012 in Ego, Leader Development, Leadership, Servant Leadership. Very touching. Washington resonates with a rare character. Leadership is about servanthood; it’s epitomising the ‘tower and basin’ attitude. Lesson Gadaffi and similar cronies would learn in their graves. The man in Syria must read this! By bowing out honourably, George Washington demonstrated a rare leadership quality which current and potential leaders must aspire to emulate. There is a time to ascend the rungs of power and a time to descend. Any deviation from this norm could generate ill feelings among the people, the consequences of which cannot be predicted. This is a great reminder not only during the 4th of July holiday but also at this point in our history and national life- thank you!